Can I resend my Digital Card? Yes, you can easily resend a Digital Card from your Digital Cards Dashboard. 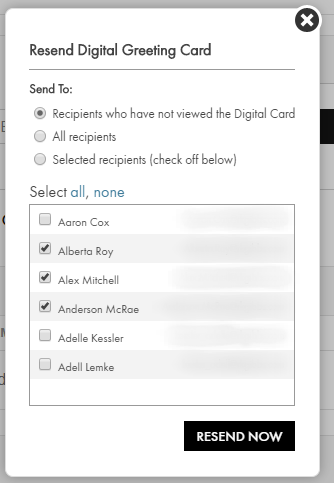 Here you can choose to resend the card to recipients who have not viewed their Digital Card or to everyone on the original recipient list. By default, we'll preselect all recipients who have not yet viewed your card. You can also choose recipients by individually selecting each one. Once you've selected the contacts you'd like to resend the card to, click Resend now button to resend the card.